Choone Do Aasman is a Smile Foundation and NDTV initiative. Choone Do Aasman series II featured true stories of children living in some of the most conflict ridden areas in India. These are stories of their aspirations, against heart shattering backdrops like drug abuse and suicide of fathers under heavy debts. But these stories are not of despair; these are stories of hope for a better future of the children who stand up in the face of these circumstances and dare to nurture a dream. This year’s campaign was a series of 15 short two-minute stories and was aired on NDTV India and NDTV 24x7, for an entire month of August 2010. These stories are set in Manipur, Kashmir, Orissa, Maharashtra, Chattisgarh, Uttar Pradesh, Bihar and Haryana – places that are politically unstable due to insurgency, caste based discrimination or communal conflict. In brief, places where there is extreme poverty and lack of infrastructure. These factual stories show children aged between 11 and 15 years who are spirited to study and want more out of life. Inspite of the difficult circumstances amidst which they live, their spirit and aspirations remain shining and grow only bigger. Smile Foundation currently reaches out to over 100,000 deprived children and youth, across 21 states of the country through more than 130 welfare projects. It has undertaken the education of all the children featured in the series in its health and education programme for underserved children. Chhoone Do Aasmaan- Series I was a joint initiative of Smile Foundation and NDTV to bring to light the hidden aspirations of less privileged children. 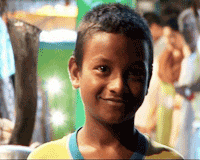 A series of short films on the real life stories of children living in the slums of big and small cities were telecast under the campaign Chhoone Do Aasmaan from August 31 to October 31, 2009 in NDTV India. It was an attempt to showcase the dreams and aspirations of the underprivileged children residing in the urban slums across the country. The campaign ended with a one hour show anchored by Mr Pankaj Pachauri on November 1, 2009. Many eminent personalities were part of the panel discussion. He works to make ends meet at the Fish Market in Kolkata.. 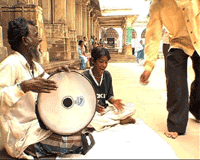 He uses his voice and his wonderful music to beg for money at Sarkhej Dargah in Ahmedabad.